With the cost of groceries skyrocketing these days everyone is trying to find ways to stretch their grocery budget. Learning the different ways that you can stretch a pound of ground meat is worthy of your playing around with in order to save money. 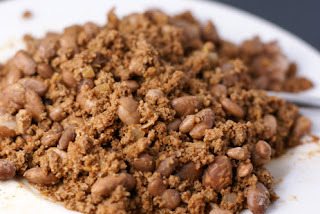 There are different ingredients you can add to ground beef (or turkey, chicken or pork) and you may find your self using different methods for different recipes. Stretching ground meat that is going into sauces such as spaghetti sauce, or tacos, may be different than ways to stretch it for hamburger patties, meatloaf, etc. You may be thinking your family will never go for it. But I assure you, they either won't notice at all in most cases, or will adjust very easily in others. 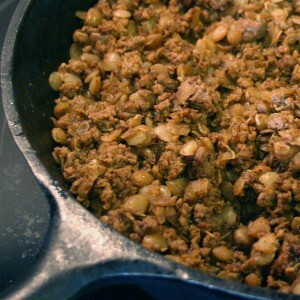 The ingredients here, usually take on the taste and even the texture of the ground meat. You will find that this means they blend in or complement your recipes rather than take away from them. How much you add to your ground meat is up to you. If you are just starting out then, just substitute 1/2 or a 1/4 of my suggestions and see what you think. I bet you'll find yourself quickly increasing your filler as you find it doubling your ground meat in a lot of recipes. I use about one cup of one of the following ingredients to each pound of hamburger. Hand mix them right into the raw hamburger before cooking, and of course add in any other ingredients in the recipe such as an egg, bread crumbs, etc. The following ingredients will blend right in to your recipes and be barely noticeable, and even boost the nutrition also. In a sauce like spaghetti sauce your family won't really even notice, In the case of Mexican, like taco night, over time my family got very used to pinto beans, tvp, or corn (or all three) being mixed right into the meat. TVP*: (textured vegetable/soy protein) they are dehydrated crumbles. that look and taste like ground meat. 1 cup tvp = approx. 1 lb. hamburger.